There are thousands of royalty free photos for you to use to promote sports and activity campaigns. These include photos from Sport England, NHS, Department of Health, Sustrans and England Netball. If you’re looking for ways to increase your participation in sport and activity, then look no further. 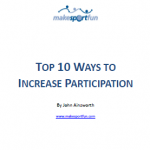 We’ve analysed 12 research reports from key sources based on millions of pounds of research and identified the top 10 ways to increase participation. We’ve then added in case studies showing where each tactic has been implemented and we’re making it all available for free in this easy to read pdf report. Interview with Julian Pratt from Yorkshire Sport Foundation on how you might be able to access £9,000 of Google Ads for free every month. Please note – Google only offers this to charities, not to councils or private organisations. Jo Foster is a physical activity behaviour change expert who was responsible for developing the national Let’s Get Moving pathway for the Department of Health. She then developed the award-winning Move More programme for Macmillan Cancer Support. This programme engaged tens of thousands of inactive people living with cancer into physical activity and has recently won a behaviour change award. In this What’s Working Now session we’re going to be covering what’s working now for engaging over 55s into walking groups. This will be hosted by John Ainsworth from Make Sport Fun, and we’ll be talking about how we’ve run campaigns for various local authorities that engaged thousands more over 55s into walking groups. Interview with Chris Bartlett director at Freestyle Martial Arts Watford and Hertford. He has successfully built a 140-member martial arts academy and will be sharing his top tips on how to build a highly profitable fitness business. During the interview we talked about the COM-B behaviour change model, what it is and why it’s so important to help you identify how to influence behaviour change. The 40 top behaviour change techniques for engaging people in physical activity. The award-winning Move More behaviour change pack and support; why it worked so effectively and how it was developed. What ideas you can implement locally. Luke Martin and Louise Sheridan are responsible for communications for Walking for Health. They developed and ran a series of Facebook ad campaigns that engaged over 20,000 people interested in walking groups. Learn about the process they used and why Facebook Ads might be the biggest opportunity you’re missing out on right now. Daniel is currently Public Health England’s marketing manager for London, managing PHE’s relationships with key non-commercial partners in the capital, including all 33 London boroughs, the NHS, the GLA and London Councils. During the interview we talked about important themes in physical activity promotion; using digital in your marketing and behaviour change work, and why it’s so important and common mistakes people make in using digital.